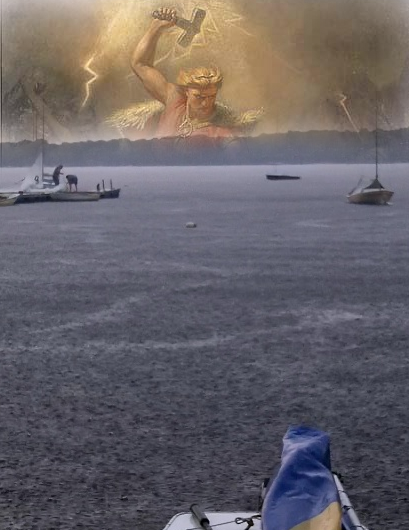 Massapoag Sunfish Fleet News: Thor Has Terrible Timing! Racing was called off today because our week long heat wave decided to fight it's last stand with the cold air coming on from Canada at Lake Massapoag during the first leg of the first race. It was 94 degrees and mostly sunny at race time with wind appearing to come from straight up. To say the wind was squirrely would be an improvement. The intrepid Race Committee struggled to set a square course, and finally gave up, leaving us with a triangle course that was sometimes square, sometimes heavily favored on the right, sometimes favored on the left, and even sometimes downwind. Then Thor arrived, putting an immediate stop to the proceedings. Everyone scrambled to shore and abandoned their mobile aluminum and fiberglass lightning rods to wait it out in the clubhouse. The battle was over and weather cleared up just about when racing would have finished for the day.